Volume - Higher volume of data, that includes the 360-degree view of information, thereby increasing insight and depth of information ensuring better decision making. Velocity - This refers to the influx and exploration of flowing data. Increasing the speed at which customer data is fed into the Big Data platform leads to increased likeliness to make the right decision at the right time to achieve management goals. Value - This dimension talks about value identification of information. Higher the consolidation, cleansing, consistency of information, there are increased chances of accurate decision-making. Variety - Different data sources and many forms of data, be it from the server logs, ERP/CRM systems, social media and many more, help increase in better informed decisions. 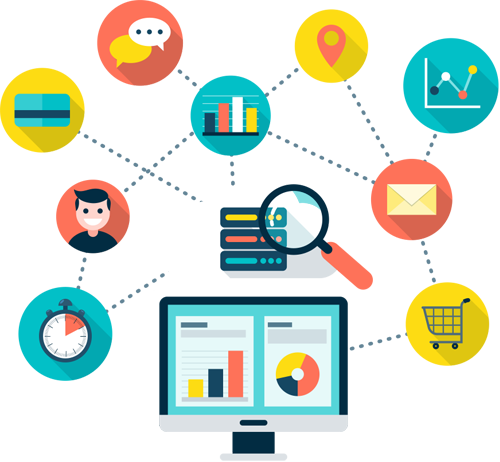 Data governance is the overall controlling of the availability, usability, integrity and security of data used in an enterprise. A data governance program includes a governing body or council, a defined set of protocols and a plan to execute those procedures. Customer analytics is a combination process of market segmentation and predictive analytics by using this we can segregate the customer behavior data to help make business decisions. This information is mainly used by businesses for direct marketing, site selection, and customer relationship management (CRM). Churn analytics have become an essential tool in the prevention of customer churn, which can be an expensive toll on a business's bottom line. The lost revenue alone is reason enough to prevent churn, not to mention the added marketing expenses to acquire new customers. Big Data platforms effectively and efficiently capture, process and analyze the data for organizations to gain a clear and complete understanding of their business which would lead to efficiency improvements, lower costs, increased sales and better customer service. Database migration is a complex, multi-phase process, which usually includes assessment, database schema conversion (if you are changing engines), script conversion, data migration, functional testing, performance tuning, and many other steps. At Teplar, We have expertise in Big Data solutions using Hadoop, the next generation real-time analytics and an open source framework, which allows distributed processing of massive chunks of data sets across clusters of multiple computers using simple programming models. We are giving dedicated big data analytics services that will improve your business decision-making process more accurately. Why TEPLAR for Big Data Analytics? Our Big Data experts are proficient at providing robust and scalable frameworks that can smoothly work with other third-party systems. Our years of experience in handling various aspects of database management for a wide-spread clientele around the world says it all. We respect the your business data confidentiality and security. we always signed with common agreement for NDA clauses. Our successful implementation and existence in multiple countries across the world talks about our widespread experience.